An annual holiday tradition returns to Atlanta's famed Peachtree Street, Saturday, for the 34th annual Children's Christmas Parade. 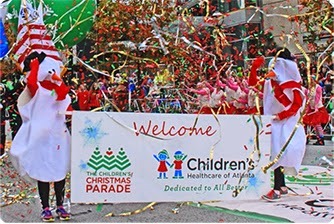 Sponsored by Children's Healthcare of Atlanta, the parade is the largest of its kind in the Southeast. More than 300,000 spectators are expected to line Peachtree Street in Midtown Atlanta for bands, balloons, clowns, floats, and of course, the guest of honor -- Santa Claus! The Children’s Christmas Parade will kick off the holiday season Saturday, 6 December 2014, from 10:30AM to noon. Proceeds from the parade will help fund programs and equipment to serve patients and families at Children’s Healthcare of Atlanta. This year 3-year-old Knox Bishop of Marietta will be featured as Face of the Parade. Knox was successfully treated at Children’s for a spinal tumor. He and his family will lead the parade down Peachtree. For those seeking front-row access, reserved bleacher seats are on sale for $18 and can be purchased at www.choa.org/paradebleachers. The Children’s Christmas Parade will also air live on WSB-TV Channel 2 (ABC) beginning at 10:30AM WSB-TV anchors Linda Stouffer and Fred Blankenship will provide viewers with live updates along the parade route. The parade will start at Peachtree Street and 16th Street and continue for one mile, ending at Peachtree Street and 5th Street. The route is easily accessible to spectators by MARTA, with the Midtown, North Avenue and Arts Center stations all within walking distance. For more information, visit www.choa.org/parade.